Imagine yourself clicking on your My Documents folder. Then you click on a folder where you store you very large library of embroidery designs. (We know you have a large stash!) 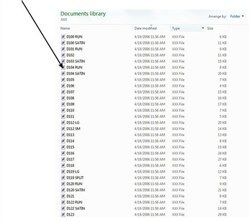 In the past, you would see a list of file names but no preview. Finding the embroidery designs was a challenge. How can your creativity flourish under such restrictive conditions? All you really want to do is find the perfect design from your library for your next embroidery project. Your embroidery files WITHOUT the Embrilliance Thumbnailer (See image below). The file names are plain and non-functional! Now your creativity and productivity will flourish! 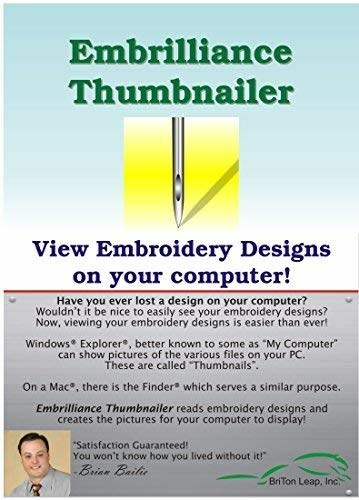 With the Embrilliance Thumbnailer, you can actually SEE the embroidery designs! No more guessing what "Butterfly.pes" or any of your designs look like anymore! After installing the Embrilliance Thumbnailer software, I opened up a folder labeled Butterfly, where I store one of my favorite butterfly designs. I click on the file, and am able to preview the design on the right of the screen! Wow! Control how you want to preview! This software not only lets you preview the designs but you can control how you preview them! 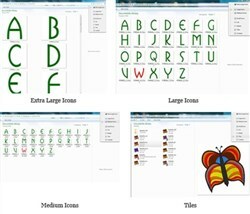 Take advantage of the preview options built into Microsoft Windows-like Extra Large Icons, Large Icons, Tiles and more! 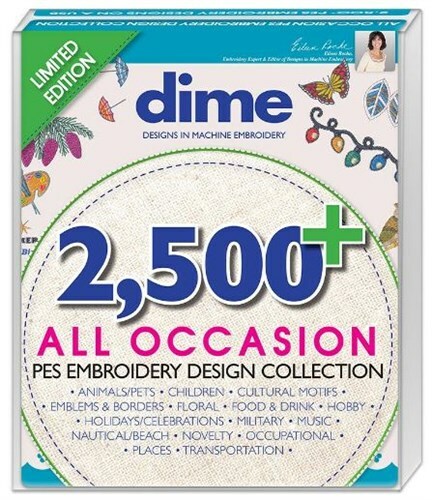 This software is a must-have embroidery tool for every machine embroiderer. Simple to install and even easier to use, you'll wonder how you ever functioned without it. It also works on your Mac. Program requires approximately 10mb of disk space. IMPORTANT: Once you open a software package it is not returnable. We will gladly exchange any defective merchandise for the same title. Be sure to double check all information on the package before you open it. This is a fabulous product! I just need to make my project simpler. If I could go back in time this would be my FIRST purchase after buying my machine. I can't believe I waited so long. Embroidery is so much more enjoyable with this program! 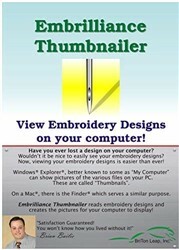 This is an excellent way to be able to quickly find an embroidery pattern from the many you have on your computer. Don’t know how I ever got along without it. have spent the evening moving files over. its fantastic. It is so much easier to choose a design when the picture appears in the file list in an easy to see, easy to grab format. Thank you. Wow - cannot believe how easy it is to use and I can see all my designs. Have been able to categorize into folders now.